Whether you are still menstruating (regularly or not), or you are in perimenopause or menopause, the simple method called “seed rotation” can help. When a naturopath first told me about the seed rotation method (also referred to as “seed cycling”), I was skeptical that such a simple method could be that transformative for so many women. Even though naturopathic schools teach this method in their curriculum, to my surprise, I had not heard of many women using it. I still remember the first client I tried it with – she had heavy 20-day periods that would completely deplete her. She was anemic, miserable, helpless and paralyzed in her life. She didn’t want to get on birth control pills (which her doctor told her was her only option). She was looking for more natural ways to normalize her cycles. The other big surprise came when I started using seed rotation with women going through perimenopause and menopause. Many started reporting the reduction of hot flashes, night sweats, and better sleep. This is when I knew that seed rotation was more than just an innocent use of random seeds. Here is the key idea: Seed rotation can be used to boost estrogen levels in the first part of your cycle (called the follicular phase) and progesterone levels in the second part (called the luteal phase). Women in perimenopause and menopause will also benefit from this method – more on that below. Seed rotation is great for any woman experiencing symptoms of estrogen dominance as well as low estrogen. The symptoms of estrogen dominance can manifest as any of the above-said. It is also the leading cause of estrogenic cancers such as breast, uterine and ovarian cancers. Thyroid nodules and thyroid cancer have also been linked to estrogen dominance. The first is when estrogen is broken off into too many “dirty” estrogens (also known as “antagonistic estrogenic metabolites”). The second scenario is If you have too little progesterone to oppose estrogen levels. The seed rotation method can also help women low in estrogens such as in the case of perimenopause and menopause. This method can help by gently raising estrogen levels through seeds containing phytoestrogens, gentle, naturally-occurring estrogens. This is why many women who experience hot flashes, night sweats, weight gain, and memory loss also report significant improvements from using the seed rotation method. It is also worth noting that women experiencing menopause and perimenopause can also experience symptoms of estrogen dominance. It might sound odd because this is the time when estrogen levels drastically drop (and this is why so many new, unexpected symptoms occur). This is also the time when most women are diagnosed with ER+ (estrogen-receptor positive) breast cancers – which is caused by estrogen dominance. So how can you be in menopause (with low estrogen levels) and still experience estrogen “dominance”? Even though you are low in estrogen, the way your body breaks down those available estrogens is unfavorable and you are producing too much of the “dirty” estrogens that are responsible for the growth of malignant tissue. You have insufficient levels of progesterone to oppose estrogens. The good news is the seed rotation method can help with both estrogen metabolism and progesterone production. Of course, being regular is one important factor, but there is much more to a balanced cycle. So many of us are so accustomed to feeling terrible before our period (and some women in the mid-cycle or during ovulation as well) that we assume it is normal. Low progesterone levels can manifest in ways similar to the above, along with infertility, miscarriages, feeling anxious, not being able to fall or stay asleep, mid-cycle spotting and menstrual headaches. In a perfectly healthy woman, the menstrual cycle and the estrogen/progesterone production will happen naturally with no help or intervention. Unfortunately, this is not the case for many women today. The key culprits? Excessive stress leading to excessive cortisol release, environmental toxins, poor diet, food sensitivities, digestive issues, and high coffee or alcohol consumption can all contribute to irregular or painful periods and even infertility. Supporting the body with food that will help produce sufficient amounts of estrogen and progesterone is not only easy and cheap, but also non-invasive. This is why this form of healing is preferred by practitioners who work with food as medicine – this method works simply, while still being gentle on the body. Many women worry that they are already experiencing estrogen dominance, so why add more estrogen in the form of phytoestrogens found in some of the seeds in the seed rotation method? For this to be fully understood, we first need to establish that not all estrogens are “dirty,” and the one that tends to be high in estrogen-dominant women is estradiol, also known as E2. Excessive levels of E2 have been linked to breast and prostate cancer. The seed rotation method does not only suppress estradiol production, but it also nudges estradiol metabolism in a positive direction by generating a higher ratio of the “clean” metabolite 2-hydroxy-estrone versus the more harmful 16-hydroxy-estrone. Our hormones work like an orchestra – they all need to be in sync for us to feel and look good. Estrogen dominance can raise thyroid binding globulin (as the name implies: it “binds the thyroid hormone”), making less thyroid hormone available for the body to utilize. As mentioned above, estrogen dominance is cited as the potential cause of thyroid nodules and even thyroid cancer development (medical reference here). 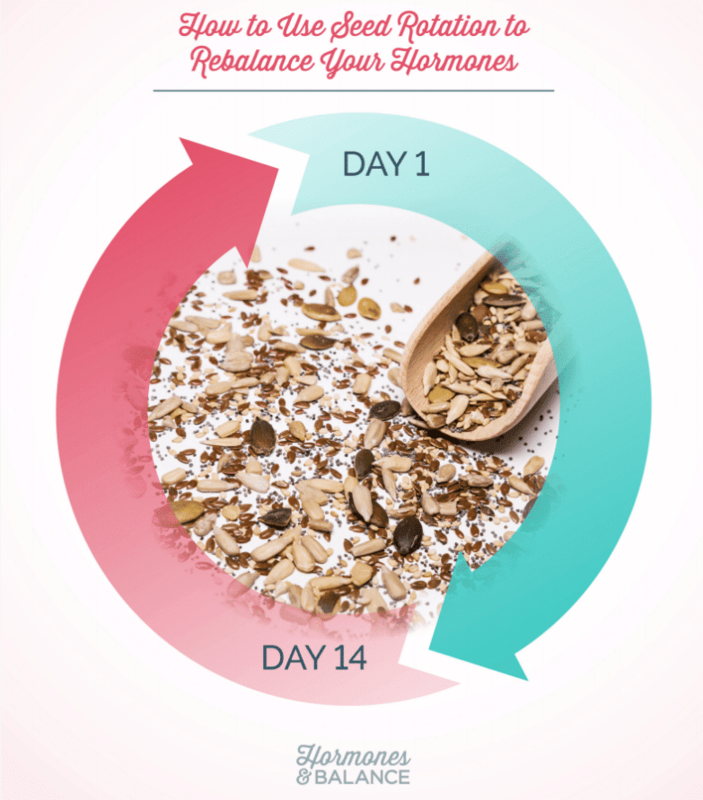 The seed rotation method can be an easy and inexpensive way to rebalance our estrogen levels. I invite you to download the Seed Rotation Starter Kit to fully understand this method and apply it right away. Both the pumpkin and sunflower seeds should be shelled & presoaked. Yes, absolutely, it is such an non-invasive and safe way to help your body produce sufficient Pg and Est (which you are deficient in, this is why your cycle is so long). Hi Magdalena, If my cycle has been running longer than 30 days, should I do the seed rotation by the number of days in my cycle cut in half, or should I do 15 days of each? Also, can you recommend a good substitute for sesame which I’m sensitive to? Thanks! In post-menopause you can rotate them every week or two. Seed butters are great, too. Great question! In response to this question, I wanted to make sure. Would it be okay for me to replace using the grounded seeds with pumpkin seed butter in the first phase and then sesame seed butter / tahini in the second? I am post menopausal as well and I follow the new moon cycle. It helps to keep me on track as to where I am. This means in the second phase of the cycle I should not be taking Flax seeds and Sunflower seeds and visa versa. how much evening primrose oil during days 15-30? During pregnancy, would you suggest to stop rotating and focus on progesterone boosters? We are TTC and hoping this is our month. I’ve been seed cycling for a couple months now and would like to know what is recommended during pregnancy. Should I continue with the progesterone boosters? Unfortunately, Magdalena does not make recommendations during pregnancy. It is a very customized time. I had to have breast reduction earlier this year and am so afraid my breasts are growing again 5 months after the surgery. Have not gained or lost any weight but this must be hormonal imbalance. Also have no thyroid since 2001 and take Nature-throid for it. This sounds interesting I am 61 and diagnosed with Hashimotos 2 years ago. I believe it was hormones that eventually kicked off the disease. I am sensitive to sunflower and sesame seeds, but eat pumpkin seeds almost every day and flax seeds 3-4 times per week. Is there anything I can eat in place of the sesame and sunflower?. I take dim plus and bio-identical progesterone. I am peri menopausal. She I go off those if I start the seed rotation diet. If I don’t take them I have super heavy periods and irritability. if I have an IUD (Mirena) should i ditch it ASAP?? I am menopausal for 3 years . I am in desperate need of this protocol. I tried it one month and spotted for a several days so I discontinued! How do I use the seed rotation to help with anxiety, energy, horrible sleep patterns, mood, and overall well being in menopause, without encouraging spotting? My symptoms have lead me to try lots of supplements but they all haven’t worked in some form for me. Would chia seeds work in place of flax seeds? Also, for women like me and my sister who have strong mood shifts on the first drop in estrogen just after ovulation, would taking all the seeds for a couple of days help to bridge the gap? I’m worried that stopping the estrogen supporting foods, right at the time when estrogen is about to plunge and cause problems, will just make it worse. It’s the days in the estrogen valley that we are affected by the most. Again in the second drop in estrogen, coupled with drop in progesterone, during the PMS time (last 3 days of cycle) we also get very moody/emotional. During that time seed rotation would have us eating Pg enhancing seeds. But it seems like having some estrogen foods at that time would also be helpful, due to the drop in estrogen. Does the seed rotation work the same if you had a hysterectomy? I know this is an old post but I was curious if you’d ever gotten a reply? I had a complete hysterectomy even years ago (removed it all) and would love some balance. Thanks! Hi Wendy: thanks for your question. Yes, the rotation works the same for you. Is this all for post menopause and post hysterectomy women, age 62? It makes 20 crackers and you can eat one 1-2 a day. They will keep in an air-tight container for up to 2 weeks. You do not need to grind and yes you can. soak them. There is a slight variation for the progesterone crackers. I haven’t received instructions for my starter kit yet. I’ve submitted my email address twice. Hi Cheryl, I ordered it for you. However, you need to confirm your email address. Check your spam/junk mail just in case. Let us know if you do not receive it. today. Thank you for this information! I’ve wondered for a few years what alternative is available for balancing hormones. This is enlightening and so very helpful….and doable! So glad you find it helpful! Thank you for sharing! I am allergic to tree nuts, is there an acceptable substitute for the almonds in the cracker recipes? Does baking with these seeds change their hormone balancing properties? I sometimes use ground sunflower seeds instead of almond ‘flour’. No, she does recommend to keep the temp low as not to burn. The healing properties are still present. Day 15, start the sesame and sunflower for a full 14 days even when the pink spotting of “day 1” shows up? So, now we are taking the sunflower/sesame on Days 1-3 in order to complete the previous cycle. Then day 4 -14 we take the flax/pumpkin. This is 11 days of the flax and pumpkin. Start sesame/sunflower again on day 14 for a full 14 days, even if pink spotting comes early again. Hi Rachel, my cycles are similar to yours. Clarification for seed rotation in this case would be great. Start at spotting and switch at day 13…next month switch at day 14. When the spotting starts again…switch back, even if it is early. See how that goes for you. How much Evening Primrose Oil should be taken along with sunflower and sesame seeds? Follow the directions on the bottle of primrose oil and that will be good. I had no period for 2 months I started seed cycling and had 2 within a month. I just started seeds with the moon cycle but should I follow my latest period which came on the new moon? It was a perfect period no symptoms whatsoever!!! very good to hear you are seeing positive changes! Hi Linda: I suggest you divide your 22 day cycle in half. The first half, take the appropriate rotation seeds and the last half, the appropriate seeds. I hope this helps! With I believe flax seeds and sesame seeds I see choices of brown and golden. Does it matter? In the Cycle diagram, it describes all of the seeds as ground (w/ the exception of Evening Primrose Oil) but in the text she really only talks about grinding the flax seed. Is it necessary to consume all of these in ground form in order to get the full potency or can we consume pumpkin, sunflower, and sesame as whole seeds? I am allergic to almonds. Is there anything that I can use in place of the almonds in the crackers? Be careful: Sesames seeds have been shown to reduce DHEA. Thanks for this comment – please can you send a link to further info on this as we (my daughter esp) eats tons of tahini and so she might need to hear about any issues with too much sesame and hormone balancing. As long as the seeds are soaked and dried, is it necessary to grind them all – or can I just grind the flax and sesame seeds? Hi! Thank you for sharing this. I am exactly backwards from the moon cycle. I start around the full moon. Should I reverse the seed rotation and or if I follow the moon cycle the way you have it listed now, flax and pumpkin starting tomorrow on the new moon, will it regulate my period to the moon cycle? Hi Maggie, My suggestion is to take the estrogen boosters on the 1st day of your period. Then, switch after the 14th day to the progesterone boosters. Most of the time, your body will naturally coordinate with the lunar pattern within a few cycles. Where do you purchase the seeds? You can find them in the grocery store, health store or online. Hi there! I snack on almonds every day and I was wondering whether I need to stop snacking on them during the progesterone boosting phase? Thanks! Great! Thank you so much for the reply. Whatever day you get your cycle go back and start and day 1 again. Hi Michelle, Yes continue the seed rotation in hopes that your body will “get with the program” and follow your lead. Hi! thank you very much for your blog! Please, I have large uterine fibroids (the biggest is 13cm). It is ok to consume the estrogenic seeds in my case? The seed rotation balances both estrogen and progesterone. There are other things you can do for estrogen dominance. Here is another article to read about it. https://hormonesbalance.com/articles/what-is-estrogen-dominance-as-a-hormonal-imbalance-in-women/ I hope this helps. How can I add this to my diet of I have 7 day period then like 5 off then get my period again? It seems like I ALWAYS have it. I am seeing a Dr and got testing done but won’t get the results for another few weeks. So I would love to start trying this! Thank you for sharing . Follow the seed rotation as if you have a regular cycle with day one and continue the plan. After that we suggest diving deeper into the Cooking for Balance Program to work on your hormone balance further. Thank you for sharing. That must be frustrating to have such an irregular cycle. Begin the seed rotation on the first day of your period and keep following it for a 28 day cycle, switching seeds at day 14 even if you start your period before then. Keep a regular seed cycle to setoff you body begins to follow the seed cycle with you. Be patient with yourself and give yourself plenty of time for rest and relaxation like epsom salt baths and a regular bedtime schedule. I’m glad you are getting additional testing with your doctor too. All the best to you! You can try using the seeds on your next cycle and see how it goes. When you get your tests results back from your doctor you can dial in a new plan. It will be important to see what your test results are. I’m going to give anything to raise my progesterone a try. I love your positive attitude. Let us know how it goes for you. I’m 47 and haven’t had a period in 4 months. I don’t have any symptoms but concerned I’m going through menopause too early. I take hemp oil and mix with kefir and stevia and drink. It’s not too bad. The seed rotation could be helpful in balancing your hormones and perhaps getting you back on track. It is hard to say what is occurring with your cycles but is normal to experience changes in the perimenopausal phase. Tonya, Navigating perimenopause can be tricky. You can try using the seed rotation during this time to help your body through it. Let us know how it goes. Thank you for sharing. Hi, I appreciate this info. My cycle was regular for years until about a year and a half ago when it shortened from 28-30 to 25 days. Then I had a month of almost daily bleeding then about a year back to normal then fir the last three months it’s been put of whack again. I had no true period last month only bleeding. Then had a real one two weeks ago with three days of no bleeding then started a light period. Since I’m so out of whack, when should I start the seed rotation? Thanks! I’m sorry you are experiencing such difficulty with your cycle. I know that can be really frustrating. If it is that out of whack start the seed rotation on the new moon and begin to cycle it with a natural rotation of the moon. Lucky for you the new moon is coming up soon. I hope this is helpful. I’m 61 yrs old, still having hot flushes and several other menopausal issues. I want to start the seed rotation. So 2 weeks flax seed ground and pumpkin seed and then 2 weeks sesame seeds and sunflower seeds. 1 spoon of each every day. Hi Monique, Yes, grind the seeds and that is easier to do with raw seeds rather than soaked. Hi Robin, there is not another seed for sesame so just don’t use that one. HI, I started the seed rotation plan and I am entering my second month. I am allergic to flax and sesame so I am using pumpkin and sunflower seeds. When I take the pumkin seeds…3 days in I feel great…no hot flashes and I sleep straight through the night. When I take the sunflower seeds I have hot flases that are off the charts and up most of the night. Should I just use the pumpkin seeds or do I need more time on the plan? Not sure which way to go here….but those heat flashes and not sleeping are driving me crazy! lol!!! I’m sorry you are still having some issues with hot flashes. Seed rotation is one way to help the body find balance. Keep giving it a try and work on some other aspects at the same time. Restoring the liver will help with the hot flashes too. Managing stress and keeping a good bedtime schedule is key for good sleep. If you are not doing it already, look into the cooking for balance program. You can avoid the sunflower seeds and just use the sesame seeds if you have an intolerance to them. For the pumpkin and sunflower seeds, might we simply eat them as a snack, instead of grinding them? I’m thinking of traveling for work and carrying snacks and such. Or in cases where I can’t soak or bake when out of town. What do you recommend for women with continuous (literally) menstrual bleeding who are trying to regulate their cycle? …Right now, my bleeding is pretty heavy. I eat a “perfect”, clean, healthy, organic, local diet but don’t know what else I can do to help fix it asap. I had this as well and I was also eating healthy. My lining was too thick and my body was not ovulating. The bleeding was my body’s way of trying to flush out the continual build up of lining. A prolonged, thickened lining is not a good thing to have, and I would talk to a doctor who will listen. I had to see several myself and I’m glad I did. I hope this helps and that you start to feel better. I really understand how hard it is. If you were like me and you feel stressed, please try to relax as the stress does not help either. Hi, Did you ever find anything to help this? Starting this seed cycling and other dietary measures this week, but I have the exact same thing. So frustrating! 1. I have heard the seeds need to be ground up. Does it matter? 2. If I have a problem with higher estrogen, should I skip the estrogen booster seeds? Now I’m getting my period less often (the last time was over 2 and a half months), and that’s fine with me. I don’t want artificial monthly periods for years to come, which I get the impression might happen if I keep creating artificial hormone cycles by eating the seeds. So when should I take each kind of seed and for how long? Hi, do the seeds need to be soaked or just ground? also, I have fairly regular cycles but use an OvaCue to monitor ovulation. Should I switch the seeds at day 14 no matter what, or should I wait and switch after the device confirms ovulation. Thank you! Hi there, this might be a silly question, but can you bake the seeds into a muffin? Or do they loose their nutritional healing qualities once they’re cooked/baked? The reason I asked is because I noticed you say to ‘dehydrate the crackers’ rather than bake them in your recipe. Hi, I menstruate regularly and sometimes d flow is very heavy and I’ve also stopped ovulating for about 2 years now, the doctors said it’s called anovulation. Can I take these seeds? Yes, Edis, you can use the seed rotation. It may be helpful with your heavy flow. It doesn’t mention if you should soak the seeds first before grinding if so how long to soak? Also, this chart doesn’t include evening primrose oil should this be used with the sesame seeds, and sunflower seeds (3) seeds on days 14-28? Hi,I was wondering how much evening primrose oil should I use? Also, should I have the ground sesame seeds, sunflower seeds & Evening primrose oil together at night or can I have all 3 in my morning smoothie or have the ground seeds in morning smoothie and evening prim rose at night ? Hello I have pcos and I was advised to have soaked pumpkin seeds daily throughout my cycle. Will this affect progesterone levels in the second phase? Also similarly if I consume sesame seeds in the day 1-15 phase will it harm my cycle ? I’m 39 and am experiencing heavy prolonged periods with extremely large clots (to the point of needed blood transfusions and irons injections etc). It looks like my body has adjusted to having periods around the same time of each month now but the heavy prolonged bleeding still remains. I’m on day 2 of the cycle and plan to try the seed rotation tomorrow (day 3). Could you please clarify that if my cycles goes beyond 30 days, do I simply stop taking the seeds at day 30 and then wait for the next cycle then start the seed rotation again? 1st phase take Flax & Pumpkin…2nd phase take sesame & sunflower. KK I need to understand is the first phase the first of the month to the 14th and the second phase the 14 to the 28th of the month. So they for I am asking is full moon the 14 of each month and new moon the first of each month. Can I use tahini instead of crushing sesame seeds? I’ve been seed cycling since just before ovulation this cycle. I’m now at day 28 and there is a tiny bit of blood. (This is really exciting as my cycle has been 36 days or longer since the birth of my second child, and I’d love for it to be a 28 day cycle, and to eventually be tied in with the moon cycles). It doesn’t appear as though my period is properly coming… I have pain (unusual) and sporting, but that’s it…. so I’m wondering what I should do now? Will taking flaxseeds and pumpkin seeds (estrogen) today help my body to know it’s time to menstruate? Or should I continue with the sesame and sunflower seeds (progesterone) until my period is properly here? Is there any recommendation for the various types of sesame seeds available? White or black? Hi ~ I’m trying to prevent an ER+ stage one breast cancer and about to start hormone therapy (probably an aromatase inhibitor) but I would rather find a natural solution to reducing my strong estrogen/weak progesterone situation. Does the seed rotation work for a post-menapausal woman who no longer has a cycle? Thanks! Is day one the first day you start your period? Thank you so much for this info. I am potentially perimenopausal and haven’t had a period in 6 months. I have been seed cycling for the past 3-4 months and I JUST GOT MY PERIOD!! I do attribute this to seed cycling. Last month I had cramps like I was going to start but didn’t. And now here I am, hopefully more regular! The only question I have is now that I have a cycle, do I go by the 15 days or my cycle now? Thank you!!!! If I started my period three days early should I change seeds on the moon cycle or according to my period? Hi Faith, You can change according to your period. My cycles are always regular (28 days) but I have severe endometriosis. Should I still use the seed rotation method? Hi Gulnaz, Magdalena says that endometrosis is a persistent and highly inflammatory condition and may require a more engaged approach then just seed rotation. She recommends to make the diet changes (follow the Estrogen Dominance Guide) in my protocol cookbook Cooking for Hormone Balance and use these supplements – https://hormonebalancenutritionals.com/collections/frontpage/products/estrometabolizer-kit . This combination will help manage and might reverse endo. I am very interested in the seed cycling guide but i does not pop up in my email. I have tried three times. This has been a tremendously helpful article, thank you! I have PCOS and my cycle ranges between 30 and 45 days. I’m confused about when I should be switching seeds? Should I change seeds every 15 days? For instance, I am now on day 37 of my cycle. I did flax and pumpkin seeds for 15 days, and then switched and am still doing the sesame/sunflower seeds, but my period hasn’t come yet. Should I just keep going with the sesame/sunflower untill it comes? Or switch back to pumpkin/flax after 15 days regardless of whether or not my period has started? Would it be more helpful for my body if I measured my basal temperature, found out when I ovulated, and then switched, even if that means I’d still be having very long cycles? Hello, this is a great question and I look forward to the reply from the team. I did seed cycling for 3 months, then became pregnant. I am due to give birth in 3 months. When breastfeeding my other children I always had very short cycles (21 days) and spotting. What seeds would you recommend for nursing without getting a period or spotting? The info is so much interesting how to balance the hormones naturally- has salpingo-ophrectomy- and I started the seed roration today following the what had in the seed rotation chart. my question is i am in a bio-identical hormone, do I still continue it, while i just started the seed rotation, do I also need to take evening primrose for the 2nd phase of seed rotation? what is the effect of evening primrose and bio identical hormone? and how long do I need to take evening primrose? and bio – identical hormone? When it comes to supplementing with estrogens (typically estrone (E1), estradiol (E2) and estriol (E3)), or DHEA/testosterone, we recommend that you work under the supervision of a functional practitioner who has years of experience with bioidenticals. Hello I have pcos and I was recommended to have soaked pumpkin seeds daily. Will this affect the second progesterone phase ? Similarly if I have sesame seeds earlier in the cycle will it harm the cycle ? As long as you are getting 1 Tablespoon of each seed into your diet in the proper phase, you can add whatever else you’d like. Your body will take care of getting what it needs. Can the Complete Guide be delivered electronically? I live in the UK and it would be easier to receive it by e-mail. I am postmenopausal and cannot even remember my cycle days. From other comments I understand that it is possible to do the seed rotation? I am also sensitive to flax seed (food sensitivity test) and have been told to avoid it. What would be a good substitute please? Thank you for your help. I usually have pumpkin seeds on a salad. But during the Sunflower seed stage, can I still have pumpkin seeds on a salad plus the sunflower seeds, or should I not have any pumpkin seeds at all during the second half? I usually just have those 2 seeds, not the others as they get stuck in my gums when the seed is too small.